The national flag of Bangladesh (Bengali: বাংলাদেশের জাতীয় পতাকা) was adopted officially on 17 January 1972. It consists of a red disc on top of a green field, offset slightly toward the hoist so that it appears centred when the flag is flying. 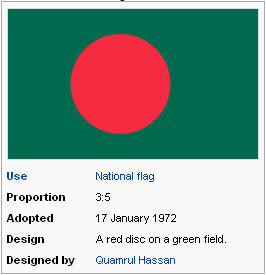 The red disc represents the sun rising over Bengal, and also the blood of those who died for the independence of Bangladesh. The green field stands for the lushness of the land of Bangladesh. The flag is based on a similar flag used during the Bangladesh Liberation War of 1971, which had a yellow map of the country inside the red disc. In 1972 this map was deleted from the flag. One reason given was the difficulty for rendering the map correctly on both sides of the flag. Origin: The first flag of Bangladesh was designed by Student Leaders of Shawdhin Bangla Nucleus painter was Shib Narayan Das and was made from clothes donated by the owner of Apollo Tailors, Bazlur Rahman Lasker, of Dhaka’s New Market. On 2 March 1971, the initial version of the flag was hoisted in Bangladesh for the first time at Dhaka University, as the Vice President of Dhaka University Students’ Union (DUCSU), student leader A. S. M. Abdur Rab, raised the flag. The flag was conceived so as to exclude the crescent and the star considered as symbols of West Pakistan. According to CIA World Fact Book, the green used in the flag represent the lushness of the green landscape of the country. The flag will be in bottle green and rectangular in size in the proportion of 10:6, with a red circle in near middle. 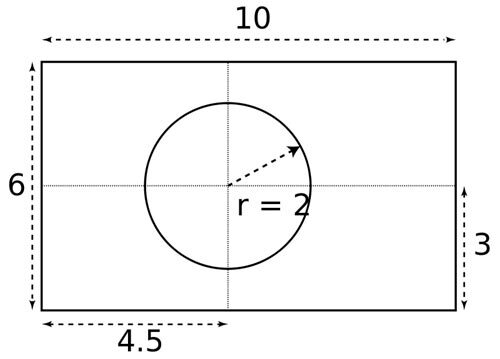 The red circle will have a radius of one-fifth of the length of the flag. Its centre will be placed on the intersecting point of the perpendicular drawn from the nine-twentieth part of the length of the flag, and the horizontal line drawn through the middle of its width. The green base of the flag will be of Procion Brilliant Green H-2RS 50 parts per 1000. The red circular part will be of Procion Brilliant Orange H-2RS 60 parts per 1000. Depending on the size of the building the flag sizes will be 10 ft × 6 ft (3.0 m × 1.8 m); 5 ft × 3 ft (1.5 m × 0.91 m); 2.5 ft × 1.5 ft (760 mm × 460 mm). The size of the flag for car is 12.5 in × 7.5 in (320 mm × 190 mm), and the size of the table flag for bilateral conferences is 10 in × 6 in (250 mm × 150 mm). Protocol: The national flag of Bangladesh is flown on all working days on important Government Buildings and offices, e.g., the President House, Legislative Assembly Buildings, etc. All Ministries and the Secretariat Buildings of the People’s Republic of Bangladesh, Offices of the High Court, courts of District and Session Judges, Offices of the Commissioners of divisions, Deputy Commissioner/Collectors, Chairman, Upazila Parishad, Central and District Jails, Police Stations, Primary, Secondary and Higher Secondary level Educational Institutions and other buildings notified by the Government from time to time. Ministers of State and Persons accorded the status of a Minister of state, Deputy Ministers and Persons accorded the status of a Deputy Minister while on tour outside the capital within the country or abroad are entitled to fly the flag on motor vehicles and vessels. The Chief justice of Bangladesh. The Leader of the Opposition in Parliament. Persons accorded the status of a Cabinet Minister. Persons accorded the status of a Minister of State. Persons accorded the status of a Deputy Minister. Heads of Diplomatic/Consular Missions of Bangladesh in foreign countries. Chairmen of Chittagong hill tracts district offices of Rangamati, Khagrachari and Bandarban.